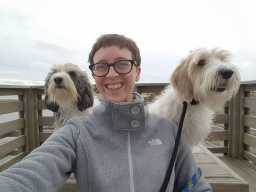 Coady Egan, AKC Canine Health Foundation Executive Assistant, is a graduate of Bridgewater State University, earning a BA in anthropology with minors in health resources management and public relations. She completed a public relations internship with Plymouth County 4-H Extension, and her background includes department liaison and customer support representative roles with VCA Animal Hospitals in MA and NC. She also worked as a boarding supervisor for a private animal hospital in MA. She was previously with the American Kennel Club in Event Operations - Conformation and Obedience. Coady is a member of the Petit Basset Griffon Vendeen Club of America, and the Carolina Petit Basset Griffon Vendeen Club. She and her PBGVs, Rowan and Sadie, compete in conformation, obedience, rally, hunting, and agility.